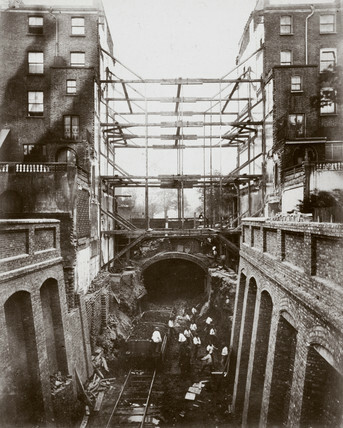 One of a series of photographs by Henry Flather showing the construction, undertaken between 1866 and 1870, of the Metropolitan District Railway's (MDR) underground lines between Paddington and Blackfriars via Kensington. The line laid by the MDR from the 1860s onwards was designed to provide a rail connection for travellers between London's mainline railway terminals, situated in a ring around the city centre. It now forms part of the existing District and Circle Lines on the London Underground. Due to complaints from the tenants in Leinster Gardens, a false, trompe l'oeil house was constructed between the two buildings seen here, hiding the rail tracks from view. Laying timber on the Metropolitan District Railway, London, c 1868. Constructing Paddington (Praed Street) Station, London, 1866-8. Construction of the Metropolitan District Railway, Craven Hill, London, c 1868. Construction of the Metropolitan District Railway, Blackfriars, London, c 1869. Site clearance at Queen Victoria Street, Blackfriars, London, c 1869. Construction of the Metropolitan District Railway, Praed Street, London, 1866. Construction of the Metropolitan District Railway, Praed Street, London, c 1867. Construction of the Metropolitan District Railway, Paddington, London, c 1867.